Move over, candy apples – there’s a new treat in town! As a kid, I just couldn’t seem to lock in the lesson that candy apples can be quite the disappointment. I loved the look of their glossy, sugary coating and would badger my parents to buy me one at least once a year at an exhibition or carnival. Every darn time, I’d take a couple of bites and remember a few simple truths: the candy shell is not as tasty as it looks AND they’re actually really hard to eat. Fast forward to last week when, in a reflective mood, I pondered dunking bite sized pieces of fruit in hot sugar syrup. 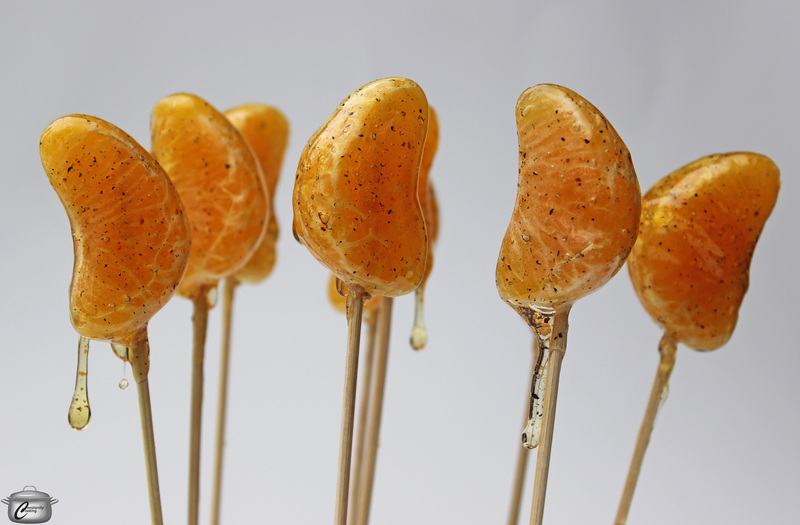 Good news, friends: these beautiful little lollipops are actually really tasty and they’re super easy to eat as well. Clementines and blackberries were my first experiments but if you need me, I’ll be in the kitchen dipping all the fruit. Grapes! Raspberries! Blueberries! Kumquats! If I can put it on a skewer, it’s getting candy-coated. Put the sugar, water and ground cardamom into a small, heavy-bottomed saucepan. Heat the mixture, without stirring, over medium heat until it turns golden and reaches 305F on an instant-read digital or candy thermometer; this will take about 10 minutes. While the syrup cooks, place the block of foam on a platter – you’ll be using this to hold the dipped fruit skewers in place while the candy coating cools and hardens. Push the pointy end of short a bamboo skewer partway through each piece of fruit. You want to segment to be firmly on the skewer but ideally the tip of the skewer isn’t poking through the fruit. When the syrup reaches 305F, take the pot off the heat and place it on a cutting board or other heatproof surface. The syrup will be burning hot so be very, very careful as you hold the end of each skewer (one at a time) and dip each piece of fruit into the pot, coating thoroughly. Tilt the pot with one hand as needed to make a greater depth of syrup for dipping. Stick the skewer into the foam block to dry, starting at the centre of the block and working your way out. Repeat with remaining pieces of fruit. If the syrup starts to thicken too much during the dipping process, return it to the stove on medium-low heat for a few minutes to soften it and then resume dipping. Candy-coated fruit is best enjoyed the day it’s made but I can attest to the fact that is still absolutely delicious (especially for breakfast) the next day. This entry was posted in candy and tagged better than storebought, candy, candy apples, candy coating, dipping fruit in sugar syrup, fruit filled candy, gluten-free, party treats, Paula Roy, Superbowl, sweet treat, Valentine's Day, vegan, vegetarian, what to serve at a birthday party. Bookmark the permalink.